A remarkable documentary by Soviet film maker Gavryushin Constantine Lavrent'evich has recently been posted on YouTube. Made in 1930 and classified as an 'educational and cultural documentary' it revealed for the first time, to most Soviet citizens, the monuments and life of their Eastern comrades. 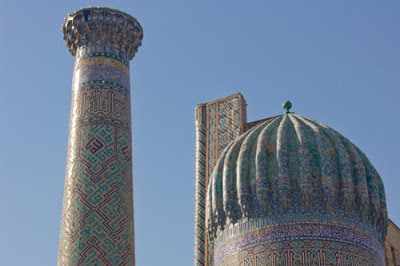 For travellers who know Samarkand and those who are planning to visit, this 9-minute clip is a must-see. No matter if you don't read Cyrillic - the images are extraordinary. Remember that it was only in 1924, six years earlier, that the Uzbek Soviet Socialist Republic was created. In this short documentary, a precious record of transition, you will notice some women still covered in paranja and others in Western-style frocks. There are younger men who have swapped a traditional skull cap for a Russian cap. The market scenes are filled with melons, the chaikhanas (tea houses) are busy, and donkeys are everywhere. Blow the video up to full screen size and settle back. For some it will evoke recent moments of walking through the same streets and squares, for others you will be wandering around the very same places this year. (If you are unable to see the video on your device, click this link: http://www.youtube.com/watch?v=NtM7tVc0DWg). Source: Thanks to Samarkand guide and food writer, Suzanna Fatyan, for alerting me to this clip.